I'm trying to install LESS on my machine and have installed node already. However, when I enter "node install -g less" I get the following error and am not sure what to do? npm ERR! command "node" "/usr/local/bin/npm" "install" "-g" "less"
Re Explosion Pills "An installation can run arbitrary scripts and running it with sudo can be extremely dangerous!" Seems like using sudo is the wrong way of doing it. "Change the owner of the files in your /usr/local folder to the current user:"
Then you don't require root permissions to perform the installation and you can still use the binary. This would only apply to your user, however. If you want the entire system to be able to use the module you would have to tell everyone to add your path. More complicated and robust solutions would include adding a folder with node modules / binaries that a group could install to and adding that to everyone's path. Just prepend sudo to the beginning of your command. As stated before, an installation runs some scripts that might be dangerous but I saw installing globally helps a lot and is way simpler. Below is extracted from the URL for your convenience. Test: Download a package globally without using sudo. If you're doing a fresh install of Node on Mac OS, you can avoid this problem altogether by using the Homebrew package manager. Homebrew sets things up out of the box with the correct permissions. I kept having this problem because windows was setting my node_modules folder to Readonly. Make sure you uncheck this. Make sure Track only root files is checked in the settings of 6.
npm has an official page about fixing npm permissions when you get the EACCES (Error: Access) error. The page even has a video. Change the permission to npm's default directory. Change npm's default directory to another directory. In my case i needed to update the npm version from 5.3.0 → 5.4.2 . Before i could use this -- npm i -g npm .. i needed to run two commands which perfectly solved my problem. It is highly likely that it will even solve your problem. Then you are good to go. Hope This solves your problem. Cheers!! There are 2 folders in users//appData/roaming --> npm folder and npm-cache folder. Delete both of these. Now, go to nodeJS site, and install again. Select 2nd option in installation option (ie npm package). Install it. You problem must be solved by now. Tried solving this issue by using Homebrew but it was also installing node in /usr/local directory which would again cause EACCES error. Had to use a version manager like nvm for more informations see the official npm guide. 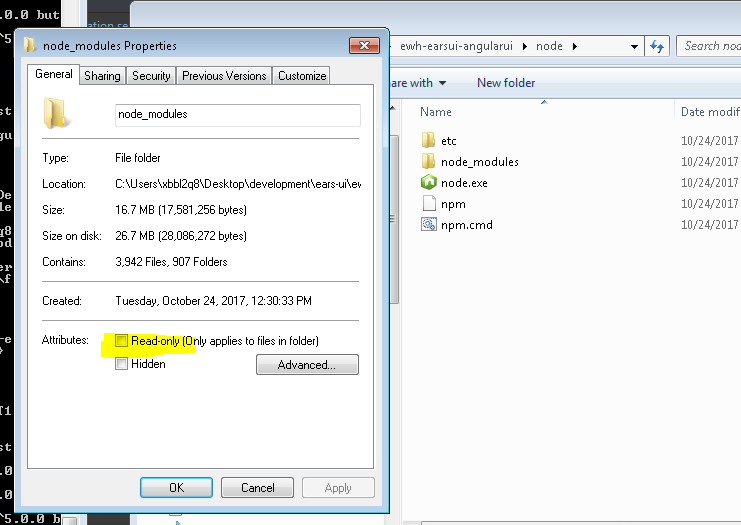 nvm installs node and it's modules in the user's HOME FOLDER thereby solving EACCES issues. Not the answer you're looking for? Browse other questions tagged node.js linux less or ask your own question. Does installing Node.js under Windows have any security implications?